For a list of nationalities, see List of adjectival and demonymic forms of place names. Nationality is a legal relationship between an individual person and a state. Nationality affords the state jurisdiction over the person and affords the person the protection of the state. What these rights and duties are varies from state to state. In older texts, the word nationality rather than ethnicity, often used to refer to an ethnic group (a group of people who share a common ethnic identity, language, culture, descent, history, and so forth). This older meaning of nationality is not defined by political borders or passport ownership and includes nations that lack an independent state (such as the Arameans, Scots, Welsh, English, Basques, Catalans, Kurds, Kabyles, Baloch, Berbers, Bosniaks, Kashmiris, Palestinians, Sindhi, Tamils, Hmong, Inuit, Copts, Māori, Sikhs, Wakhi and Székelys). Individuals may also be considered nationals of groups with autonomous status that have ceded some power to a larger government. Nationality is the status that allows a nation to grant rights to the subject and to impose obligations upon the subject. In most cases, no rights or obligations are automatically attached to this status, although the status is a necessary precondition for any rights and obligations created by the state. In European law, nationality is the status or relationship that gives a nation the right to protect a person from other nations. Diplomatic and consular protection are dependent upon this relationship between the person and the state. A person's status as being the national of a country is used to resolve the conflict of laws. Within the broad limits imposed by few treaties and international law, states may freely define who are and are not their nationals. However, since the Nottebohm case, other states are only required to respect claim by a state to protect an alleged national if the nationality is based on a true social bond. In the case of dual nationality, states may determine the most effective nationality for a person, to determine which state's laws are most relevant. There are also limits on removing a person's status as a national. Article 15 of the Universal Declaration of Human Rights states that "Everyone has the right to a nationality," and "No one shall be arbitrarily deprived of his nationality nor denied the right to change his nationality." Nationals normally have the right to enter or return to the country they belong to. Passports are issued to nationals of a state, rather than only to citizens, because the passport is the travel document used to enter the country. However, nationals may not have the right of abode (the right to live permanently) in the countries that grant them passports. 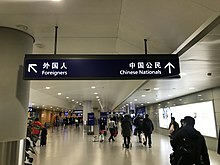 Immigration inspection directory sign at Shanghai Pudong International Airport, use the term "Chinese nationals" while the Chinese text refers to "Chinese citizens (中国公民)". Conceptually, citizenship is focused on the internal political life of the state and nationality is a matter of international dealings. In the modern era, the concept of full citizenship encompasses not only active political rights, but full civil rights and social rights. Nationality is a necessary but not sufficient condition to exercise full political rights within a state or other polity. Nationality is required for full citizenship, and some people have no nationality in international law. A person who is denied full citizenship or nationality is commonly called a stateless person. Historically, the most significant difference between a national and a citizen is that the citizen has the right to vote for elected officials, and to be elected. This distinction between full citizenship and other, lesser relationships goes back to antiquity. Until the 19th and 20th centuries, it was typical for only a small percentage of people who belonged to a city or state to be full citizens. In the past, most people were excluded from citizenship on the basis of gender, socioeconomic class, ethnicity, religion, and other factors. However, they held a legal relationship with their government akin to the modern concept of nationality. United States nationality law defines some persons born in U.S. outlying possessions as U.S. nationals but not citizens. British nationality law defines six classes of British national, among which "British citizen" is one class (having the right of abode in the United Kingdom, along with some "British subjects"). Similarly, in the Republic of China, commonly known as Taiwan, the status of national without household registration applies to people who have Republic of China nationality, but do not have an automatic entitlement to enter or reside in the Taiwan Area, and do not qualify for civic rights and duties there. Under the nationality laws of Mexico, Colombia, and some other Latin American countries, nationals do not become citizens until they turn 18. Nationality is sometimes used simply as an alternative word for ethnicity or national origin, just as some people assume that citizenship and nationality are identical. In some countries, the cognate word for nationality in local language may be understood as a synonym of ethnicity or as an identifier of cultural and family-based self-determination, rather than on relations with a state or current government. For example, some Kurds say that they have Kurdish nationality, even though there is no Kurdish sovereign state at this time in history. In the context of former Soviet Union and former Socialist Federal Republic of Yugoslavia, "nationality" is often used as translation of the Russian nacional'nost' and Serbo-Croatian narodnost, which were the terms used in those countries for ethnic groups and local affiliations within the member states of the federation. In the Soviet Union, more than 100 such groups were formally recognized. Membership in these groups was identified on Soviet internal passports, and recorded in censuses in both the USSR and Yugoslavia. In the early years of the Soviet Union's existence, ethnicity was usually determined by the person's native language, and sometimes through religion or cultural factors, such as clothing. Children born after the revolution were categorized according to their parents' recorded ethnicities. Many of these ethnic groups are still recognized by modern Russia and other countries. Similarly, the term nationalities of China refers to ethnic and cultural groups in China. Spain is one nation, made up of nationalities, which are not politically recognized as nations (state), but can be considered smaller nations within the Spanish nation. Spanish law recognises the autonomous communities of Andalusia, Aragon, Balearic Islands, Canary Islands, Catalonia, Valencia, Galicia and the Basque Country as "nationalities" (nacionalidades). National identity is a person's subjective sense of belonging to one state or to one nation. A person may be a national of a state, in the sense of being its citizen, without subjectively or emotionally feeling a part of that state, for example many migrants in Europe often identify with their ancestral and/or religious background rather than with the state of which they are citizens. Conversely, a person may feel that he belongs to one state without having any legal relationship to it. For example, children who were brought to the U.S. illegally when quite young and grow up there with little contact with their native country and its culture often have a national identity of feeling American, despite legally being nationals of a different country. Dual nationality is when a single person has a formal relationship with two separate, sovereign states. This might occur, for example, if a person's parents are nationals of separate countries, and the mother's country claims all offspring of the mother's as their own nationals, but the father's country claims all offspring of the father's. Nationality, with its historical origins in allegiance to a sovereign monarch, was seen originally as a permanent, inherent, unchangeable condition, and later, when a change of allegiance was permitted, as a strictly exclusive relationship, so that becoming a national of one state required rejecting the previous state. Dual nationality was considered a problem that caused conflict between states and sometimes imposed mutually exclusive requirements on affected people, such as simultaneously serving in two countries' military forces. Through the middle of the 20th century, many international agreements were focused on reducing the possibility of dual nationality. Since then, many accords recognizing and regulating dual nationality have been formed. Statelessness is the condition in which an individual has no formal or protective relationship with any state. This might occur, for example, if a person's parents are nationals of separate countries, and the mother's country rejects all offspring of mothers married to foreign fathers, but the father's country rejects all offspring born to foreign mothers. Although this person may have an emotional national identity, he or she may not legally be the national of any state. The following list includes states in which parents are able to confer nationality on their children or spouses. ^ In Burundi, women nationals can confer their nationality on their children if their children are born out of wedlock to unknown fathers or their fathers disown them. ^ a b c d e Women only can confer their nationality on their children who are born in the nation; children born without the nation can not acquire citizenship. ^ a b c d e f Women nationals can confer their nationality on their children whose fathers are stateless, whose fathers' identities or nationalities are unknown, or whose fathers do not establish filiation with such children. ^ In Iraq, nationality law limits the ability of Iraqi women to confer nationality on children who are born without the nation. ^ In Kuwait, a person whose father is unknown or whose paternity has not been established may apply for Kuwaiti citizenship upon the age of majority. ^ In Lebanon, women only can confer their citizenship on their children who are born out of wedlock and whose Lebanese mother recognizes them as her children during such children's minority. ^ In Syria, mothers only can confer nationality on their children who are born in Syria and whose fathers do not establish filiation of such children. ^ In United Arab Emirates, mothers only can confer nationality on their children who attain the age of 6 years. ^ a b c Vonk, Olivier (March 19, 2012). Dual Nationality in the European Union: A Study on Changing Norms in Public and Private International Law and in the Municipal Laws of Four EU Member States. Martinus Nijhoff Publishers. pp. 19–20. ISBN 978-90-04-22720-0. ^ Convention on Certain Questions Relating to the Conflict of Nationality Laws Archived 2014-12-26 at the Wayback Machine. The Hague, 12 April 1930. Full text. Article 1, "It is for each State to determine under its own law who are its nationals...". ^ a b c d e f g h i Kadelbach, Stefan (2007). "Part V: Citizenship Rights in Europe". In Ehlers, Dirk (ed.). European Fundamental Rights and Freedoms. Berlin: De Gruyter Recht. pp. 547–548. ISBN 9783110971965. ^ a b c von Bogdandy, Armin; Bast, Jürgen, eds. (2009). Principles of European Constitutional Law (2nd ed.). Oxford: Hart Pub. pp. 449–451. ISBN 9781847315502. ^ Sassen, Saskia (2002). "17. Towards Post-National and Denationalized Citzenship". In Isin, Engin F.; Turner, Bryan S. (eds.). Handbook of Citizenship Studies. SAGE Publications. p. 278. ISBN 978-0-7619-6858-0. ^ Oommen, T. K. (1997). Citizenship, nationality, and ethnicity: reconciling competing identities. Cambridge, UK: Polity Press. p. 6. ISBN 978-0-7456-1620-9. ^ a b c Turner, Bryan S; Isin, Engin F. Handbook of Citizenship Studies. SAGE; 2003-01-29. ISBN 9780761968580. p. 278–279. ^ International Civil Aviation Organization (ICAO), ISO 3166-1 alpha-3 codes, retrieved 2017-08-06, The Republic of China passport carried by native Taiwanese people clearly indicates the bearer's nationality as 'Republic of China.' Under international standards however, such a nationality designation does not exist. This is explained as follows. ISO 3166-1 alpha-3 codes are three-letter country codes defined in ISO 3166-1, part of the ISO 3166 standard published by the International Organization for Standardization (ISO), to represent countries, territories, etc. These three-letter abbreviations have been formally adopted by the International Civil Aviation Organization (ICAO) as the official designation(s) of a 'recognized nationality' for use in manufacturing machine-readable passports, carried by travelers in order to deal with entry/exit procedures at customs authorities in all nations/territories of the world. According to these three-letter ISO country codes adopted by ICAO, the 'Republic of China' is not a recognized nationality in the international community, and thus there is no 'ROC' entry. ^ "Gender-Discriminatory Nationality Laws". Equal Nationality Rights. Retrieved 16 September 2017. ^ "Background Note on Gender Equality, Nationality Laws and Statelessness" (PDF). 8 March 2017.